We have a laundry room in our spacious Hong Kong flat. That reveals two things already that most Hong Kong flats lack: spaciousness and a whole room for doing laundry. Our flat on the CUHK campus was designed for faculty with families. The campus itself ranges over the tree-covered sides of a mountain in the former farmland of the New Territories—a far cry from the cramped quarters of Hong Kong Island—so there is building space to space. According to campus rumor, the idea behind providing ample living and dining areas was that faculty could host student gatherings in their homes, nurturing a sense of community within the colleges. In a society that respects teachers and a university environment that wanted to lure foreign professors, faculty were (and are) paid salaries that place them above the mean and provided with housing stipends. Kitchen, laundry, sleeping cubicle—the servant’s wing. The manager handed us a binder lined with several rows of keys each tucked into a plastic pocket. In addition to keys to the front and back doors, there were keys to the kitchen, the servant’s quarters, the bedroom hall, the bedrooms, and the study. There were even keys to drawers in each of the bedroom closets. Keys to lock valuables in and potential pilferers out. Keys to lock people in? Americans uncomfortable with the idea of live-in help, we relegated the cat litter box to the cold-water bathroom. We installed an IKEA desk in the helper cubicle—a home office for my husband with the fancy university office. After years of working in the corner of a bedroom, I claimed the study as a writing room. Aiming for gender-neutral housekeeping duties, we would share the kitchen and laundry room. On first inspection, the washing machine with the folding lid looked odd and tiny. No dryer, but I was used to drying clothes on a rack in Hawaii. Then I looked up at the rows of clotheslines strung across the ceiling. My questions prompted one of our many stupid cross-cultural conversations. Me: Cool—we can hang sheets from those and we won’t have to drape them across chairs like we do in Hawaii. Him: Clothespins? That won’t work. Chinese don’t use clothespins. Me: Why not? We just need a stool. Him: That’s not how people do it. Me: Ok, how DO you do it? How are you supposed to get up there anyway? Don’t some people have a pulley system? Him: No need. 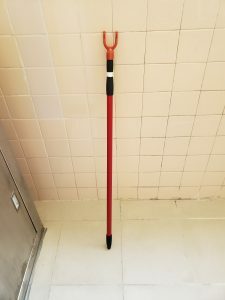 You use a handle. Me: What kind of a handle? Him: A thing with a hook. You’ve seen it. Me: I have no idea what you are talking about. I’m buying clothespins. A week later, he returned from the Taipo market with a red metal pole that ended in a sort of fork. Smirking, he showed me how to use the tool to lift the hangers and hook them over the clotheslines. Then he helped me drape the wet sheets over chairs in the dining room. Clothespins, by the way, work great to close bags of cat food. Growing up in America, I was taught a laundry list was a list of complaints. Airing dirty laundry was a derogatory metaphor for exposing private matters in public, and left hanging out to dry meant letting someone down. Personal laundry was something to be hidden, and doing so was an indicator of economic class as well as refinement. When my family moved to a nicer neighborhood, we got a fancy dryer and stopped hanging sheets in the backyard to make room for a barbecue grill and outdoor furniture. In Hawaii, my husband and I joked about how you tell where the Chinese lived by the laundry hanging in their apartment windows and lanais. 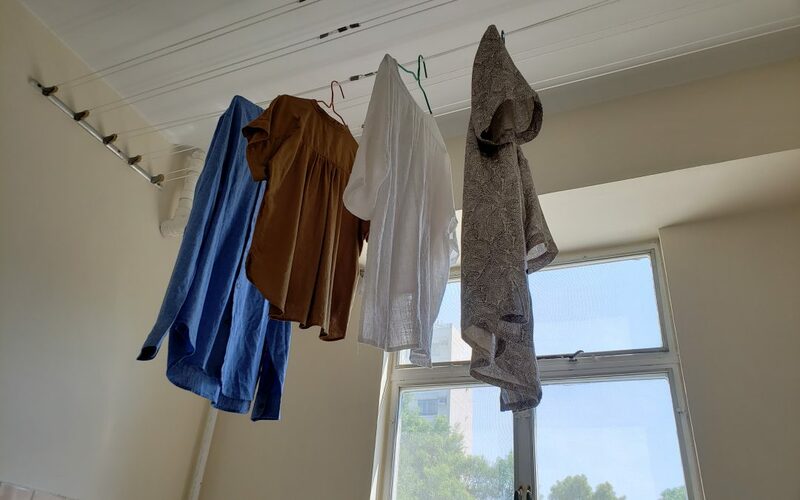 In Hong Kong, you can spot shifts from low to middle and upper-income levels by the presence and disappearance of laundry hanging on racks over the street, but I know now that most Chinese prefer drying clothes without a dryer and that air-dried clothes last longer. A dehumidifier comes in handy. Fancy flats have a drying room. And someone to do the ironing. I want to see the photo of the red metal pole that ends in a fork! In fact, I want to see the photo of Fred hanging laundry on the clotheslines with the red metal fork! Until I left Hanoi for Hawaii in 2000, I used that pole Fred got to put up hangers and get clothes air-dry almost everyday :). Have not used once again since.